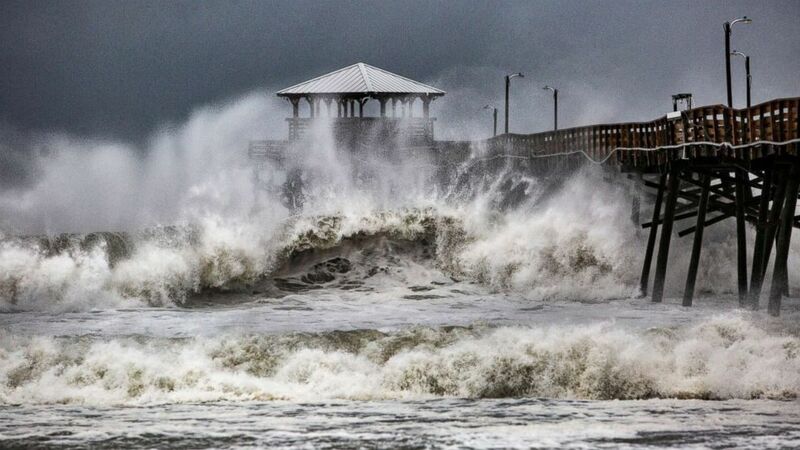 — Hurricane-force winds are moving across portions of the North Carolina coast, and water levels were rising along parts of the coastline. The threat of tornadoes increases as Florence moves closer, with landfall expected Friday morning. — The storm surge is expected to worsen late Thursday and into early Friday during high tide in the Atlantic Ocean. Map shows the projected path of Hurricane Florence as of 11am, Sept. 13, 2018. — Around 11 p.m. local time, the storm was about 50 miles south of Morehead City, North Carolina, and 60 miles east-southeast of Wilmington. Florence was progressing northwest at about 6 mph. Earlier, a National Oceanic and Atmospheric Administration observing site at Cape Lookout, North Carolina, reported sustained winds of 83 mph and a gust of 106 mph. — Though the storm, once a Category 4, was downgraded Thursday night to a Category 1 from a Category 2, the danger is very real. Parts of North Carolina may see as much as 40 inches of rain and storm surges could be as high as 13 feet. “Flooding and the storm surge — those are the two main things that kill people, and this storm is not letting up,” North Carolina Gov. Roy Cooper said Thursday. — High winds and floodwaters could knock power out for several days, if not longer, officials said. Almost 160,000 customers already were without power in North Carolina Thursday evening — and that number is likely to rise. Marge Brown, 65, says goodbye to her father, George Brown, 90, before he is evacuated from a healthcare home in Morehead City, N.C., Sept. 12, 2018, as Hurricane Florence approaches the east coast. Kelly Salisbury said she’s staying put in Kitty Hawk, North Carolina, even though most of the town left. Sand bags surround homes on North Topsail Beach, N.C., Sept. 12, 2018, as Hurricane Florence threatens the coast. In Awendaw, South Carolina, Chris Johnson said he’s staying behind to watch his house while his wife, Michele, is evacuating. “I’m not sure if I could go out in the middle of the storm on a 12-foot ladder to replace a window, but I could be on the inside and try to do something … or if the refrigerator goes out … I can take care of all of that,” Chris Johnson told ABC News. A large rain cloud passes over a day before the arrival of hurricane Florence in Wilmington, N.C. on Sept. 12, 2018. A home on Kahekili Highway near the Waihee River Bridge, was evacuated after a flash flood breached the property, Sept. 12, 2018, in Maui, Hawaii. Water floods a parking lot at a condo complex near Kahana Village in Lahaina, Hawaii, Sept. 12, 2018.